FRANCE: BIGGEST EUROPEAN WEAPONS SUPPLIER TO ISRAEL | Who is arming Palestine's occupation? According to the French Ministry of Defence, the value of arms exports by France in 2007 was worth €4.81 billion, ranking the country as the 4th global arm exporter after the USA, the UK and Russia . France receives between 4,000 to 6,000 international requests for armaments per year . In 2007, France rejected only 108 requests under various motives including peace, regional and internal stability and respecting human rights ; a stance that seems to be ignored when trading arms with Israel. Compared to the tiny rejections, France issued 6,605 arm export licenses in 2007, of which 112 went to Israel. According to the French Ministry of Defence, licenses issued to Israel are worth €126 million, making France the biggest European weapon supplier to Israel (of a total €200 million worth of arms exported from the EU to Israel in 2007) . The majority of France’s exports were conventional weapons, including €88 million in electronic equipment, especially designed for military use, €29 million imaging or counter-measure equipment also especially designed for military use, €10 million of aircraft and related material, and €1 million ground vehicles and components . France and Israel were close allies, and at some point France became Israel’s main arms supplier. Former Israeli prime minister, Shimon Peres, played a major role behind the scenes in securing weapons secretly, and buying an atomic reactor from the European country as revealed in the 2007 published book, Shimon Peres: The Biography . 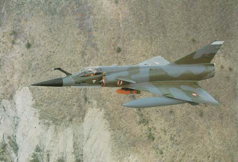 In 1967 the Israelis used Mirage IIICJ fighters during the “Six-Day War”. On the morning of June 5, 1967, Israeli Air Forces performed pre-emptive strikes on the Syrian, Egyptian and Jordanian air forces, destroying aircrafts on the ground with cannon fire and breaking up runways with French “runway dibber” bombs. This was a major advertisement to the French fighter developed by Dassault, and it helped the Mirage III become an export success . The arms embargo imposed by France on Israel followed the 1967 six days war and the raid on Lebanon in 1968. It faded away in the 1990s with the growing collaboration between the two countries on the development and purchase of drones – pilotless aircrafts or spy planes – between the European Aeronautic Defence and Space Company (EADS) and the Israeli Aircraft Industry (IAI). Drones were hailed by Israel for their used during the 2006 war on Lebanon, and to monitor Gaza district. The collaboration started in 1995 with an authorization issued by the French Ministry of Defence to EADS to purchase 4 Hunter drones from Israel. These drones were later used in Kosovo and for security measures in major events in France. In 2001, the Ministry approved another agreement worth €43 million between EADS and IAI for the purchase of 3 Eagle One drones, and one control station. The third stage of collaboration between the two countries was vaguely announced in 2004 to be later revealed in 2005 as worth €300 million for the development of EuroMale drone system (Medium Altitude Long Endurance) for civil and military use by France, again as a collaboration between EADS and IAI. In 2006, the French Israeli Chamber of Commerce revealed that IAI and EADS became long term partners for the operation of the drone system Male. This collaboration involved the establishment of a common team from French and Israeli experts based at IAI facilities for the continuous development and improvement of the drone systems . In May 2008, EADS teamed with French Thales, plane maker Dassault, and Spanish company Indra to expand its collaboration effort with IAI, and to offer MALE drones to both France and Spain . Such forms of collaboration reveal the French economic support to the Israeli war efforts, in addition to the exchange of military knowledge between the two countries. 1. Les exportations d’armement de la France en 2007. French Ministry of Defense. 3. Les exportations d’armement de la France en 2007. French Ministry of Defense. This entry was posted on Saturday, January 10th, 2009 at 10:21 am and is filed under Arms Info, France. You can follow any responses to this entry through the RSS 2.0 feed. You can leave a response, or trackback from your own site. The history is documented further back to the Israeli Nuclear reactor, with France angering the U.S. under Eisenhower, by secretly selling the “heavy water” necessary and much more. This is long before 1967.